Today’s Iceberg Arena will be something of a reversal of the usual system. Instead of trying to decide which of two or more films is the best, the winner will be the one I deem worst. This inversion should not be taken to imply that I don’t like science-fiction musicals – quite the opposite – but merely that the hybrid has produced some bizarre and dreadful messes. Even as I enjoy laughing at these failures, I sympathize with their eccentricity and ambition. “Rocky Horror Picture Show” (1975) is perhaps the only SF musical that the general movie-going public remembers, and it has certainly become the archetype of cult success that later films try to emulate. Its fame is pretty deserving in my mind, as much of the music is actually pretty catchy and the set pieces keep up with the psychotic, but inspired, narrative. 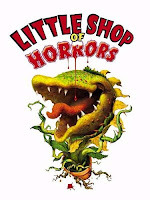 “Little Shop of Horrors” (1986) also enjoys a major cult following and at least some popular awareness, though I find the humor a bit strained. Time has been less kind to "Willie McBean and His Magic Machine" (1965), a time-travelling stop-motion children's musical adventure by Rankin/Bass (creators of perennial TV Christmas specials) that has never seen an official release, perhaps due to its constant racial insensitivity. Other than these, my favorites would have to be “American Astronaut” (2001), an idiosyncratic SF western musical that I’ve talked about before, and “Privilege” (1967), a darkly satiric rock opera about the music industry, celebrity stardom and the marketing of rebellion. If you're looking for films that are actually worth seeing, there you go. But if you are just dying to get to the driveliest drivel, skip ahead to the first contestant. SF musicals have seen a recent spike in activity during the last decade. Daft Punk has created two, the animated “Interstella 5555: The 5tory of the 5ecret 5tar 5ystem” (2003) and the less well-received “Electroma” (2006). 2006 also saw the release of Richard Kelly’s (“Donnie Darko”) sophomore film, the semi-musical SF comedy epic “Southland Tales.” Despite being inducted into the pantheon of notorious rejections during its Cannes festival premier, I’m almost fond of the overcast, schizophrenic behemoth. 2008 brought us three movies that at least partially qualify. Joss Whedon’s delightfully lightweight break from the writer’s strike, “Dr. Horrible’s Sing-Along Blog,” manages to be quick, clever and amusing. The Flaming Lips put together “Christmas on Mars,” which isn’t quite a musical but features the band and includes their instrumental tracks. The biggest budget entry of the year was “Repo! The Genetic Opera,” which was a rousing piece of hypergothic indulgence and gallows humor despite being overhyped and too unabashedly manufactured. Most of the films above have their share of detractors (and often that share is a controlling interest), but all save one were cut in the preliminary tryouts for worst SF musical. The finalists are “Toomorrow” (1970), “Space Is the Place” (1974), “The Apple” (1980) and “Electroma” (2006). 8 years before “Grease” (1978), Australian pop star Olivia Newton-John starred in “Toomorrow” (1970), a film easily worse than even “Xanadu” (1980), albeit one that was more successfully covered up (its only release was in Japan and on Laserdisc). Toomorrow features a dying race of aliens who secretly come to Earth seeking a source of life-saving vibrations. They ultimately determine that the upbeat groove of hippy band Toomorrow, led by Newton-John, can save their species, and so they hatch a largely benevolent kidnapping scheme. Their needlessly elaborate interferes with the band include fashioning an alien bimbo and abducting an entire concert venue, with supposedly funny high jinks ensuing. “Toomorrow’s” attempt to build a youth culture phenomenon around a prefab pop group is hilariously unhip, but thankfully devoid of the smug insincerity and ubiquitous product placement of our Hannah Montana generation. The characters are all bubbling fountains of unrestrained optimism plagued only by difficulty balancing their time between girlfriends and band practice and dealing with an anti-fun school principal. There are times when they’re almost endearing, but their dialogue is just too flat and stereotyped. The clunky overuse of slang dates not only the film, but the true age of the producers. The plot sputters along slowly, with far too much time spent repeating the same alien “special effects” and tame sexual comedy (think beach movies). The music is so naïve and inconsequential that one could never accept the assertion that it’s either life-giving or unique in all the universe, but it’s not without its peppy charm. More variety of tracks could have helped, but the story is awkwardly structured (the band’s inability to find a time or place to play is a key plot element) for a films that supposed to be about music. Perhaps the kitschiest moment occurs aboard the alien spacecraft, where the band members briefly transform into toddler versions of themselves during a “time and space” musical number. In the near-future 1970’s Afro-psychedelic musician-messiah Sun Ra lands his spaceship, The Intergalactic Solar Arkestra, on a vibrant jungle world. He claims the planet as the new home for the African-American people and returns to Earth to spread his invitation through music. While building a media empire to recruit passengers, he must do battle with The Overseer, a pimp in league with the white oligarchy and the evil embodiment of African-American social ills. The struggle is reflected in a real world crime feud and a metaphorical game of space-age tarot cards. After the inevitable concert finale, Sun Ra takes the souls he has saved and abandons the Earth, which promptly explodes. Sun Ra’s enormous ornamental headpieces and symbolic space-age imagery create a distinctively alternative vision that was as much about philosophy as music, but it’s largely hampered by the rock bottom production values and uninspired blaxploitation hokiness. The plot starts out high in guts and inspiration, but only drags under the weight of its many digressions and oversimplifications, petering out quickly and turning the final chapters into a death march. Sun Ra’s music is a free-ranging variety of jazz futurism and traditional African instrumentation. For many it will be a highlight of the film, but the recording is so poor and tracks so crudely integrated into the plot that it’s hard to appreciate. The fact that Sun Ra takes his distorted African-separatist mythmaking so seriously is at once the downfall of his film and the essence of its reincarnation as camp. Though it may have been intended to develop a real cult, it has at least succeeded in gaining a bemused following. Alphie and Bibi, a folk music duo from Moose Jaw, Canada almost win a glam rock megaconcert contest with their earnest, heartfelt tunes, but for the manipulation of Mr. Boogalow and his fascist corporation, Boogalow International Music (BIM). Determined to keep his brand of pulsating hypnotic disco at the top of the charts, Mr. Boogalow signs a contract with the country bumpkins and attempts to convert their image into that of his other mindless celebrity puppets. Bibi is duped, but Alphie manages to stage an uprising of homeless peaceniks (bad choice for an army as it turns out). The autocratic BIM brutally suppresses them and appears to reign supreme until the kids are saved at the last minute by God, who drives in and parades them up to heaven. “The Apple” is a hopeless mess of overdone religious allegory, B-movie SF kitsch, self-conscious trippiness and laughable lyrics and choreography. The musical confuses shiny fabric for futuristic costuming, airport escalators for set design, pop culture silliness for social commentary and ostentatious strutting for a moral message. Still, the films seems largely self-aware of its ridiculousness and occasionally gets laughs that it was probably going for. Perennial Russian villain Vladek Sheybal (as Mr. Boogalow), seems clearly in on the joke, chewing the scenery with mad-eyed grinning gusto and ignoring the screenplay as it combusts around him. The music manages to be bad in two genres, giving us reason to gag at the sappy folk music of our dumbly unsympathetic heroes and the mind-numbing beat-based loops of the equally brain-dead villains. The choreography never shies away from acting out any idiot idea expressed in the lyrics, leading to delightfully tacky music numbers in garish outfits. The coup de grace is the little silver diamonds that everyone has stuck to their foreheads, apparently just one more way to cram additional sparkles into the cinematography. The usually reliable Daft Punk takes to the screen for the second time in this ambiguous dialogue-free tale of two robots on a quest to achieve humanity. Their initial attempt, immersing their heads in grotesque masks of synthetic sludge, culminates in a disastrous chase through the robot suburbs as the beating sun melts off their faces. Later they set off into the desert where emptiness and desperation lead them to perform excruciating slow-motion suicides. Band members Peter Hurteau and Michael Reich exercise their talent for visual panache, but prove that music video sensibilities don’t always translate to the big screen. The creators have about 12 minutes worth of rather abstract ideas (not coincidentally, the length of about 3 music videos), none of which can sustain a story. Stretched out to 74 minutes these ideas don’t deserve our attention even wrapped in Daft Punk’s stirringly dream-like beauty. Almost every sequence begins by proffering a signature set of stylized images, but then immediately settles back and lazily cuts between them through endless stagnant refrains of music. The so-bad-its-good quality of “The Apple” strikes just the right balance of incidental and intentional humor, with enough highlights and surprises that making it to the end isn’t a masochistic chore. Critics rightly hated on it, but I was still joking about the film in high spirits and mockingly singing the songs days after seeing it. Failure has nearly scratched the memory of Toomorrow from the face of the Earth, but its badness is really more quaint than monumental. It has moments where it’s actually rather cute, helped by Olivia Newton-John’s good-natured persona, when it’s not being sexist and obsequious. It gets last place for poster art. A consummate misfire, “Space Is the Place” only manages to survive its many mistakes by being fascinatingly crazy. The deranged SF intrusions are like little sparks of life in a cemetery of dead scenes uncomfortably exhumed from our cultural past. Perhaps because it is the most finely-crafted of the contest entries, Electroma fails to find redemption in its own tragic hubris. One day enough time may pass for Electroma to join the other films as amusing retro camp, but it will still have too much boring pretentiousness (which doesn’t age well) holding back the blindly ambitious pretentiousness (which I admire). So Xanadu ISN'T one of the worst sci-fi musicals? Only because Xanadu isn't sci-fi. It's more fantasy by my interpretation, but I was a little kid the last time I caught snatches of it. If it's fantasy, it's a thin line. You're not the first person to mistake a 1978 disco roller-rink for the future or to interpret ONJ's clothing as post-apocalyptic astronaut rags, but I stand by my genre classification of fantasy. Cory McAbee has a new project, STINGRAY SAM, that appears to be set in the same universe as AMERICAN ASTRONAUT. Didn't make your list, but worst sci-fi musical would be THE RETURN OF CAPTAIN INVINCIBLE. 2) The ending in workprint version actually works quite well as an homage to the original film and the creature features that the musical is tweaking, though that's totally unintended. Watching it brought back memories of The Late Show movies -- and it puts the 'horror' back in 'horror musical'. The horror musical has also notched itself into its own genre - or rather, "zombie musical"; from DEAD AND BREAKFAST to the locally made SONG OF THE DEAD. One last word on sci-fi musicals - check out SUPERSTARLET A.D. by Memphis filmmaker John Michael McCarthy. I look forward to The Return of Captain Invincible and Superstarlet A.D! Why do I love bad SF musicals so much?